There’s a knitting stitch combination that I’ve seen called a gather, and I’ve mostly seen it in Estonian stitch patterns, though I’m guessing they get used elsewhere too. Essentially, they are a combination of a double decrease (or more) and a double increase (or more) happening at the same time. It sounds more complicated than it is. Take the 3/3 gather. When making a k3tog decrease, the basic principle is to insert the needle through all three stitches as if they were one stitch, and then knit one stitch in that clump of stitches. The gather expands upon that: knit those three stitches together without removing them from the needle, then yarnover, then knit the three stitches together again. This is the same as working a KYOK at the same time as a k3tog. Start with three stitches, end with three stitches, but they’re gathered together. But thinking of it as a decrease/increase started making my brain fizz. If you haven’t heard the term, tinking is the process of undoing knitting, stitch by stitch (tink is knit spelled backwards). While I like the effect of various double decreases, I have to admit that they can be kind of a pain to tink, because of the way that the stitches are out of order. I recently noticed a trick for tinking my CDDs, and so I thought I’d share it just in case it’s useful. It’s been a while since I did a link round-up! Knitted Borders and Corners – some different ways of approaching corners when working a knitted-on border. Learning, Practicing, Perfecting – Sara Lamb writes here about the learning process in respect to weaving and leatherwork, but the process itself is universal to handcraft. Well worth reading. Non-roll Stocking Stitch Edge? – well, not exactly. This post tells how to use twined knitting to make what looks like a stockinette hem that won’t curl. Bunny ears decreases– I’ve talked a little about the 3-to-2 decrease I like to use, that some people call Bunny Ears Back. It produces a symmetrical single decrease that doesn’t appear to lean to either side. They are now accounted for in Stitch Maps, which makes me happy. The linked blog post also shows a couple of stitch patterns making use of them – I really like Little Hearts a lot and am planning on making use of it. A more complex stitch pattern of mine that uses them is Beloved – and I can see that I’ll need to go edit the stitch map! Taming long floats via the STUART method for color-knitting – an intriguing trick from TECHknitter (so many of her tricks are intriguing) for dealing with long floats. This looks like it might be the key for knitting more of my code grids as colorwork even with long floats. Hm! A while ago I was dithering about what abbreviation to use for the double decrease that’s a mirror of slip 1, k2tog, pass slipped stitch over. It’s not a commonly-used stitch; I suspect because it’s fiddly. I have my fussy moments when it comes to symmetry. I’ve been writing a lot about how to keep track of where to place a line of double increases. The flip side of the problem is keeping track of double decreases, which is to say, three stitches worked together together to make one stitch. Without a certain amount of care, the location for a given stitch marker will be eaten up by the decreases. Alternately, a locking stitch marker can be placed in the base of a decrease. Another way to cope is to read your knitting and see where to place the next decrease. This blog post will discuss all three methods. Some knitting experiments are only successful because I learn from them. A while ago I was trying to improvise knitted netting, and was only half successful. (I’m still quite happy about even that level of success.) I’d been thinking for a while of trying out the decreases I’d improvised there for use in regular knitting, and this week’s post is about the resulting swatch. I am reluctant to call this effort a failure even though I won’t be using these decreases for plain knitting: too many people think failure is bad and a waste of time. But I don’t think this experiment was a waste of my time: I’ve learned that the decreases won’t work for this purpose, I know why, and now I won’t waste any more time wondering about it. I learn from failure. Mistakes are a good thing, especially when it’s just a swatch experiment. The nifty thing about these decreases is that they sit horizontally because a stitch or stitches from the previous row is passed over a single stitch before that stitch is worked. This is what makes the decreases sit flat in a way that works quite well for the netting. The other thing that’s good about them for netting is that some of the yarn in the stitch that is passed over slides into the stitch that’s worked. This is how the open spaces end up so square – the stitches between spaces get taller. 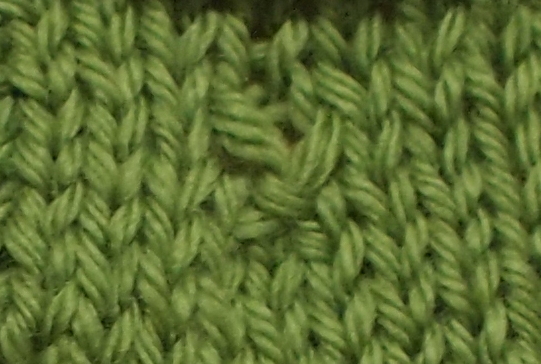 The problem is that it makes the stitch worked at the decrease point in regular knitting loose and floppy – not even as tidy as a slipped stitch. I hope to inspire people to be more willing to swatch, experiment, and be willing to make mistakes. Have fun! A bit over a year ago, I posted a way of making a lace chevron with completely symmetrical decreases, followed shortly thereafter by an improvement based on a reader suggestion. Apparently I was still unsatisfied, however, because last week a thought popped into my brain: yes, use the three-to-two single decrease to compensate for the single yarn over at the bottom of the chevron, but not on the same row as the yarn over.